The Planning Board is appointed by the Town Board and consists of seven members, two alternate members, and two consultants: the Town Engineer and the Town Building Inspector. Its primary purpose is to review site-plans that have been submitted to the Building Inspector and that would require approval of Site Plans as cited in Article IV. 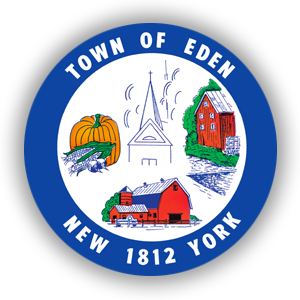 The Planning Board must take into consideration the public health, safety and welfare, as well as compliance with applicable codes and with the “Town of Eden, New York 2015 Comprehensive Plan” adopted October 11th, 2000. Site-plan approval is typically required prior to issuance of building permits. The Planning Board also reviews and acts upon applications for Minor and Major subdivision of properties. When sought or required, the Planning Board gives recommendations to the Town Board for the issuance of Special-Use Permits. To be heard at the meeting, all materials for review must be submitted to the Planning Board Secretary 15 days prior to the monthly meeting.